My personal Top Five Favorite Books lost scientific credibility years ago when I realized there were at least three times as many books crammed into this personal category of honor. I hadn’t re-evaluated what I had loved in many years, so instead of swapping out, say, The Edible Woman by Margaret Atwood for, say, A Visit From the Goon Squad, I just kept stacking titles and hoped a literalist never asked me to recite the list. Jodi and I were iTalking about Minnesota Re-Reads, doubling back to some old favorites to see how the longtime faves fared a decade, at least, since they were first dubbed best of the best. She agreed with the younger version of herself and still got misty over A Prayer for Owen Meany. 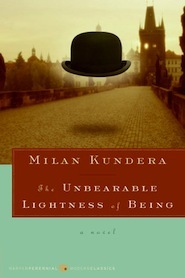 I decided to reconsider Milan Kundera’s The Unbearable Lightness of Being. I’ve read the novel at least twice and I’ve seen the movie. All I remembered was adoring it and the image of Sabine, an artist, dressed in little more than a bowler hat and walking across a mirror laid on the floor of her studio. I liked the scene enough to one year wear a bowler hat for Halloween. Kundera’s story centers on the super-sexed Tomas, a Czech surgeon, and Tereza, a woman he meets by chance, who he imagines came to him like Moses: A baby in a basket sent down a stream. Though he is in love with her, a rarity for him, he continues a relationship with Sabine, a woman who favors fiery flings over domesticity, and after Sabine, countless others. Body and soul are separate things, he tells his wife who smells the scent of other women in his hair. His infidelity gives her nightmares and damn near breaks her. But he refuses to smother the impulse for the sake of her sanity. On the sidelines is Franz, a man out of his head in love with Sabine, who confesses his affair to his pretty awful wife and subsequently gets dumped by Sabine, who no longer finds the relationship interesting in the light of his confession. At the same time, the Soviet Union has invaded the Czechs and the aftermath is pretty grim for people protesting communist rule. Rooms are bugged, people are killed and Tomas is pressured out of his high-falooting gig as a renowned surgeon when he has a political piece published in a newspaper. More than 10 years after I read and loved this book my new response is: It’s kind of a drag. Or more like a drag sandwich. Parts that interest me between slabs of stuff that didn’t. I know what I liked long ago. I liked Sabine. I liked the idea of this woman making art and eschewing husband-wife scenarios and signing on dotted lines. I liked the idea of her painting things that rankled the art world and booting dudes from her front door and, worse case scenario, changing her address if things got too out of control. I probably thought I would like to live like that, which I now see would never work for me. It’s the voice of this all-knowing third person narrator that bugs. It’s repetitious and philosophical and I had a hard time making my eyes take in every word. Right around the time I would start to glaze over with the blah-blah-blahs, the narrative would pick up again. Tereza decides to have her own fling! Or Franz takes up with a young mentee! and I’d get sucked back into it. The verdict: I think I can safely eject this one from the Top Five.